I was planning to write this last Saturday so I could schedule it to magically post on Tuesday while I was coasting down the Loch Ness monster at Busch Gardens, but Hurricane Irene and her tornado lackeys rained on my blogging parade. Luckily, the storm blew through my area by Sunday morning and didn't leave much damage in its windy wake. The Ogre and I were in Williamsburg by Sunday night, riding the sushi train at the Peking Restaurant. My mini-vacay breezed by in a whirlwind of fun. I returned home to find my pirate bookmark featured in a fantastical collection by Rhonda of Midnight's Meadow. I'd welcome more tropical storms if they brought along mermaid sculptures, sea glass hoop earrings and manatee-shaped soaps. Happy Almost First Friday! Commented on the blogs on the list above the DEST - what awesome treasuries are here!!! I actually made a treasury on Tuesday in anticipation of this post - can I post that one too? Never mind, answered my own question by re-reading. Ha! Also, glad you survived Irene's ire! I've added my latest, featuring bright chartreuse green and cool pale greys. What a beautiful treasury. Glad you enjoyed your time away and glad to hear Irene didn't leave much damage in your area. 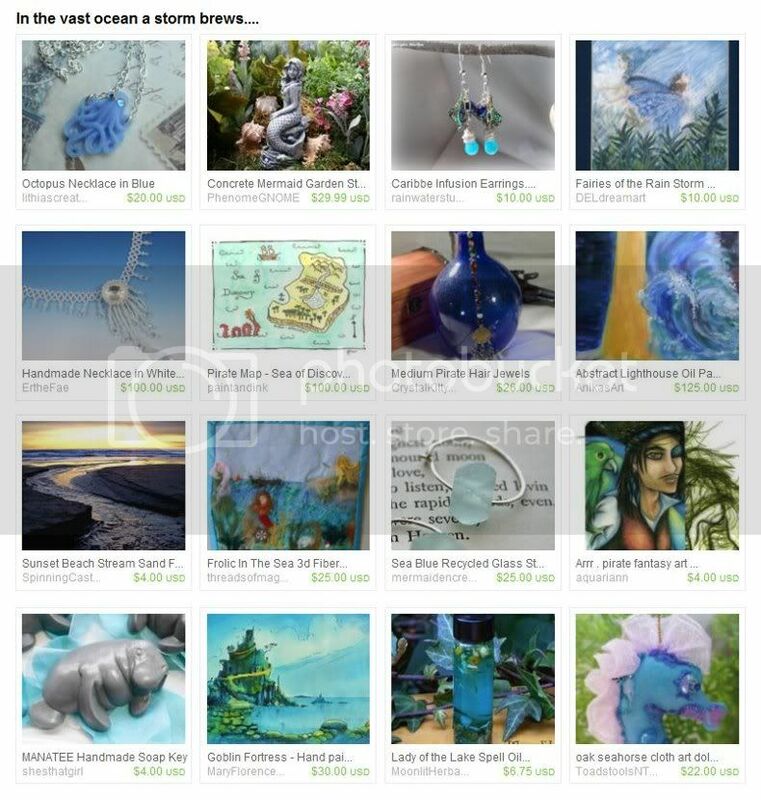 Thank you for promoting my treasury!